Got the new 5 peso coin? 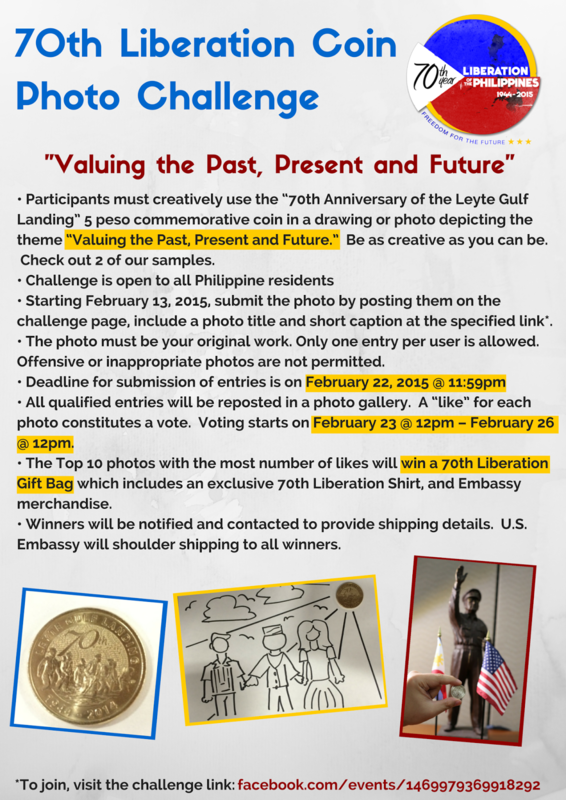 Then Join the 70th Liberation Coin Photo Challenge! Any Philippine resident age 13 and above may upload their photo and include a photo title and short caption. Deadline for submission of entries is at 11:59pm February 22, 2015. All qualified entries will be reposted in a Facebook photo gallery, wherein the Top 10 photos with the most number of “likes” will win a 70th Liberation Gift Bag which includes an exclusive 70th Liberation Shirt, and Embassy merchandise. Voting starts from February 23 12:00pm to February 26, 12pm. U.S. Embassy will shoulder shipping of prizes to all winners. The five peso limited edition commemorative coin features the Leyte Landing, which was a turning point for the liberation of the Philippines during World War II, started its circulation last December 22, 2014.